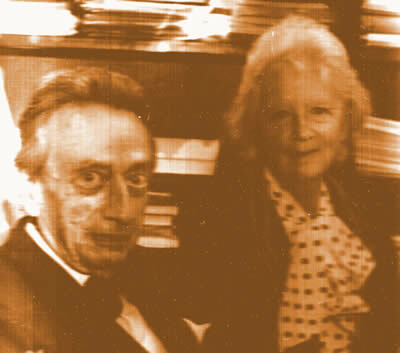 Renée and Henry Kahane, 1979. Photo courtesy of Roberta Garner, used here with her permission. The Kahane Research Room, located in 4100 Foreign Languages Building, is a small library, meeting room and study space for use by students and faculty in the Department of Linguistics. It is named after Professor Henry Kahane, who founded the Department of Linguistics, and his wife Renée. The library is home to a variety of books and journals, including dissertations by University of Illinois linguistics graduates and a number of hard-to-find working papers series and conference volumes. 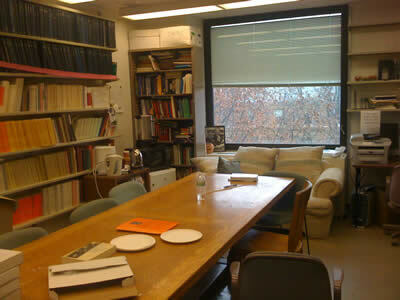 Readings for linguistics seminars are often placed on reserve in the Research Room. The Research Room has a networked computer available for student use, along with a printer/scanner/copier, coffee-maker, and small refrigerator. Linguistics faculty and graduate students may enter the Research Room at any time by sliding their I-cards through the electronic lock. New graduate students may need to contact the Linguistics Department office to be added to the list. Please note that at this time there are no open hours for the reading room. Henry R. Kahane (1902–1992) founded the Linguistics Department at the University of Illinois at Urbana-Champaign. He initiated and served as Director of the Program in Linguistics in the early 1960s. Kahane tenaciously pursued the organization of a linguistics department during a nine-year period, resulting finally in the creation of the Department of Linguistics in 1965. The department owes its existence in large part to the vision, dedication, and intellectual energy of Henry R. Kahane. He arrived at the University of Illinois in 1941 as a Professor of Spanish, Italian, and Portuguese. He retired in 1971. Kahane remained an active Emeritus Professor in the Department of Linguistics until his death in 1992. Kahane served the University of Illinois with distinction for over 30 years. He was praised by former University of Illinois Chancellor Morton W. Weir for his “quiet, intelligent, [and] perceptive” administrative service (Weir 1992: 93). He was appointed leader of seven different academic units, including four departments, one division, one program, and the Center for Advanced Study. He was an active member of the Center for Advanced Study starting in 1968. He served as Acting Director of the Center from 1971 to 1972. Kahane argued for the inclusion of Linguistics in the Division of the Humanities, a decision that greatly shaped the history of the department, making it a nurturing home for the research of such distinguished professors as Braj and Yamuna Kachru, Ladislav Zgusta, and Hans Henrich Hock. Throughout his career, Kahane was honored in multiple ways by his peers: two Guggenheim Fellowships (1955-1956, 1962-1963); Outstanding Educator in America (1974); the Silver Award of the Academy of Athens (1977); Member, US National Committee for Byzantine Studies (1981); Fellow, Dumbarton Oaks Research Institute (1985); and Fellow, the American Academy of Arts and Sciences (1989). He served as president of the Linguistic Society of America (1984), the preeminent professional society in the United States dedicated to the scientific study of language. Kahane’s personal history is truly remarkable. Along with other Austrians and Germans residing in Florence, Italy at the time, Kahane was persecuted and imprisoned in May 1938 during Hitler’s visit to that city. His unique sense of humor was evident in his own reminiscences about this chilling experience, published decades later (Kahane 1986). Calamities and political turmoil in Europe ultimately brought the Kahanes to New York in 1939. During an enforced waiting period in Greece, Kahane and his wife Renée made the best of their precarious situation, completing a book manuscript on Italian place names in Greece (Kahane & Kahane 1940). Kahane’s name has been cataloged with those of other persecuted and exiled German linguists during the period 1933-1945 (Maas 1996, 2004). Of his determination to see a department of linguistics organized at the University of Illinois, Kahane later reminisced: “It was very simple. I made it a point to visit the dean every week and stress the importance of a department of linguistics on this campus. He would throw me out the door and I would come back through the window. Finally, I succeeded” (Kachru 2005, p. 242). In the mid-1960s, linguistics was still an emerging discipline in the United States. Kahane intuitively understood the importance of a scientific approach to language that transcended work on the properties of individual languages or dialects. He supported the appointment and hire of some of the brightest young linguists of the early mid-century, including the department’s first chair, Robert Lees. These young scholars espoused a more modern, “transformational” approach to language. Kahane’s attitude towards change and innovation in the field is another remarkable aspect of his vision for the future. He contributed extensively to a Department whose graduates went on to strengthen the research and teaching profiles of many other institutions. The Department of Linguistics today still owes much of its distinguished reputation to the tireless efforts of Henry Kahane. Kahane’s intellectual legacy is no less rich than his administrative one. His publications covered Romance and Mediterranean lexicology; Byzantium and the West; the Hellenistic heritage in the West; structural analysis; literary history; humanistic linguistics; and the East and West in medieval literature (Pietrangeli 1962, 1973). His earliest investigations were in etymology, then on to the Hellenistic heritage of the West via Arabic and Jewish sources. This brought him to a “gnostic interpretation of various symbols in the song of Roland; to a new and Hermetic explanation of Chrétien’s Perceval and Wolfram’s Perzíval; and to the tracing of gnomologic, magic, and astronomic tradition underlying certain puzzling treatises of the Alfonsine circle” (Pietrangeli 1973: 1-2). Selected articles and reviews written by Henry and Renée Kahane have been published in three volumes (1979, 1981, 1986). Kahane’s assessment of the Program in Linguistics in Spring 1962 still adequately describes the Department of Linguistics a half-century later: “I feel great confidence in the future, knowing that we have gathered here an unusual group of linguists: they differ from each other in interests, methods, and personalities, to be sure, but they are homogeneous in their devotion to linguistics and their scholarly achievements" (Henry Kahane, "Program in Linguistics: Report on the Year 61-62", May 1962). In this sense, Kahane’s intellectual imprint can still be seen on the Department of Linguistics, even decades after his passing. In his honor, the Department of Linguistics has established a “Henry R. Kahane Award for Outstanding Teaching Assistant in Non-Western Languages” and named the linguistics library of the department the “Henry and Renée Kahane Linguistics Research Room”. Henry Kahane was inducted into the College of Liberal Arts & Sciences Centennial Gallery of Excellence in 2013. Text: Ryan Shosted, 2013 (updated 2018). Kachru, B. B. 2005. Henry Kahane. Language 81 (1): 237-244. Kahane H. and R. Kahane. 1940. Italienische Ortsnamen in Griechenland [Italian place names in Greece]. (Texte und Forschungen zur byzantinisch-neugriechischen Philologie 36.) Athens. Kahane, H. and R. Kahane. 1979. Graeca et Romanica Scripta Selecta, vol. 1: Romance and Mediterranean lexicology. Amsterdam: Adolf M. Hakkert. Kahane, H. and R. Kahane. 1981. Graeca et Romanica Scripta Selecta, vol. 2: Byzantium and the West: Hellenistic heritage in the West: Structural analysis, literary history. Amsterdam: Adolf M. Hakkert. Kahane, H. and R. Kahane. 1986. Graeca et Romanica Scripta Selecta, vol. 3: Humanistic linguistics: The Mediterranean, lexis, Romance linguistics in review, East and West in medieval literature, personal memoir. Amsterdam: Adolf M. Hakkert. Maas, U. 1996. Verfolgung und Auswanderung deutschsprachiger Sprachforscher 1933–1945, vol. 1, A-F. Osnabrück: Secolo Verlag. Maas, U. 2004. Verfolgung und Auswanderung deutschsprachiger Sprachforscher 1933–1945, vol. 2, G-Q. Osnabrück: Secolo Verlag. Pietrangeli, A. 1962. An analytical bibliography of the writings of Henry and Renée Kahane. Romance Philology 15: 207-20. Pietrangeli, A. 1973. The writings of Henry and Renée Kahane. Issues in linguistics: Papers in honor of Henry and Renée Kahane, ed. by B. B. Kachru, R. B. Lees, Y. Malkiel, A. Pietrangeli, and S. Saporta, pp. 1-31. Urbana: University of Illinois Press. Weir, M. 1992. Memorial tribute. In B. B. Kachru (ed.) Memorial tributes to a builder: Henry R. Kahane. Studies in the Linguistic Sciences 22 (2): 92-94.